May you rest easy and who wold have know that my son, along with others would have stood in the Honor Guard while your family was grieving, only to find that Joey would soon there after become an angel with you. Thank you for your service and may your family know we are all related because of what you and my son choose as a career. You will always be remembered!!! It is truly my privilege to ride in your honor and memory during this year's Police Unity Tour. Please be with me as we remember you and all of our fallen heroes. God, please give Trooper Nichols' family, friends and co-workers strength as we near National Peace Officer's Memorial Week. You will never be forgotten Trooper Nichols. God's peace and speed Trooper Nichols. Thank you for your brave, dedicated service. RIP Brother. On behalf of my family, I extend our sincerest condolences on the grievous loss you suffered when Jeffrey was killed. To the Nichols family, fellow troopers, and all who call Jeffrey beloved, my heart goes out to all of you and may you find comfort in your loved ones and your strength in your faith. When my son was killed, the entire law enforcement community in our area embraced us in a circle of love and support, and I know you will receive the same support. It makes the unbearable less torturous, and I pray for your solace. 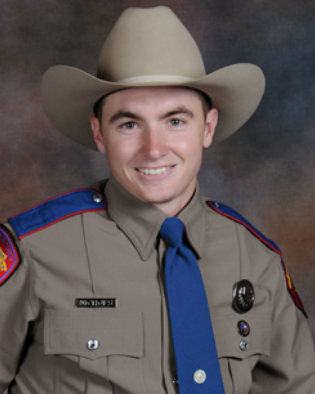 This reflection is sent with the utmost respect for the dedicated service Trooper Nichols gave to his community and the citizens of Texas, and for the supreme sacrifice he and his family made on March 26, 2016. Rest in Peace Trooper Nichols. Thank you for your dedicated service. You might be gone but will never be forgotten. May your family and friends find the comfort they need to go on. God Bless you. Hello my name is Vincent Escobedo I am currently in the Los Angeles sheriffs academy. I too have had a family member lose their life in a car accident, please know as law enforcement family we do not forget your son. Hello my name is Thomas Delgado I am from Los Angeles and am currently in the Sheriff's academy class 413 to become a Deputy. I have read your son's story and would like to send you my condolences. It takes a brave person to do this line of work, please know we do not forget your son. RIP, trooper. It is very sad that you had to leave this life so early, and you will always be remembered. Rest in Peace Brother we have the watch from here! May God Bless your family and friends. Thank you for your service and sacrifice. Rest In Peace Trooper Nichols. Our deepest heartfelt condolences to all of your family, friends, and brothers and sisters at Texas Department of Public Safety- Texas Highway Patrol. God Bless and Godspeed, sir. God bless you my brother. Thank you for your service and sacrifice. May His healing hand touch your family, friends, and fellow trooper. Rest easy my brother, we'll take the watch from here.